In Kansas, the Osage Orange tree was used as fencing. The long thorns and bushy growth on this tree kept the animals in the pasture. The trees were planted close together and cropped to fence height. Very effective and cheap. Plus the spring bloom was an added attraction. But as autumn approaches we also get tons of these from the Osage Orange tree. Their color and bumpy skin makes them perfect for fall decorations. Yesterday I spent the day shopping for fabric and looking for items that would make great props for our Hallowe'en Stocking booklet. This morning I picked the hedge apples thinking that the green would really make the colors in the stockings pop. Also found this "wicked" guy at a local shop! It rained here this morning and the light isn't good enough to begin photography for the book. After it brightens a bit more I will get everything set up and photographed. What fun! One of my favorite parts or my job. On another note....I wanted to thank all of you for your kind comments! You are the best. I have been surprised at how much I enjoy and look forward to reading your comments. I didn't realize how much I would enjoy writing to you and hearing from you when I first began this blog. And one more thing today... I want to show you what I did with my 3 aging bananas! And I must confess another weakness...see the napkin? I've been collecting these old linen napkins. We are using them too. I have found the linen washes up so nicely....not too bad to iron and such a pleasure to use. Well dear friends...confessions are over for the day. "See" you tomorrow. Your Green Hedge Apples are a great decoration for the fall season, but more so... spiders hate them and you can use them to kill off spiders. Should say..run the spiders off. My mother-in-law tells me every year...got you some Hedge Apples to chase away spiders. What a hoot! Huh ? I love your napkins. In fact, I covet your napkins. I go to estate sales to collect napkins as well as tablecloths. Every once in a while I find an exceptionally lovely piece of depression glass or lustreware. It seems like family members do not want these things; in some cases, I know the terms of the settlement of the estate require everything to be sold. I am more than happy to give them a new home and to lavish attention on them. I had to laugh at the "fun" part of your job. I just got in from shooting the photos for the covers of my new patterns that will be released at market. At a historic plantation home here - standing in the shade for each and every picture - and I was wishing for better times. Normally the "fun' part of my job as well - but not today! It's 96 degrees here - and the weather man just said it feels like 107 with the heat index. Will fall every get here? Take care! 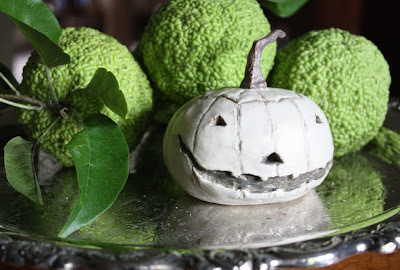 BTW - love the osage oranges and pumpkin man! Love your new pumpkin addition. Would love to have one myself to bad I don't live in Kansas City any more. Interesting info on the Hedge apple. I have a spider in my basement window that has been there since I bought the house 5 years ago. It has been so long I almost don't want to get ride of it, kind of like a pet spider now, but I think it finally needs to go. Will have to get a hold of some of those hedge apples and try them. Wish I had some of those osage orange tree, only have mulberry trees that I hate. 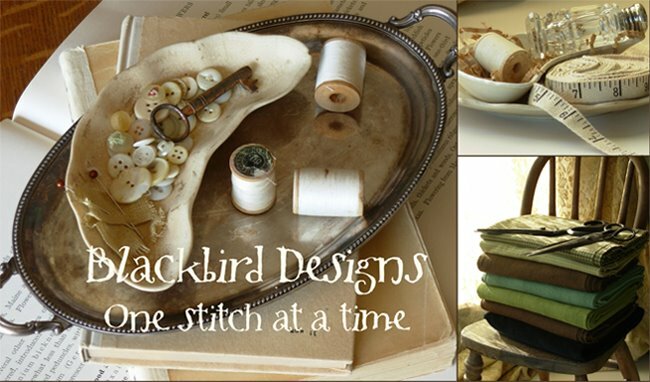 If your husband ever gets those pincushion's figured out or done, would love to hear more about them. Would be interested in purchasing one. I love to find handmade things to do with sewing and needle work, the plastic that everything seems to be made of now doesn't have the same appeal. Look forward to your next post as they are always very interesting. I love that you use linen napkins. I have used cloth napkins my whole life and people are really shocked when they first come over for a meal. They don't know what to do with them. I love the tactile feeling of cloth. It is so much more personal. What a great pan! I am going to have to look for one of those. I always place two muffins in my husband's lunch this would be a great substitute. Your muffins look yummy. Beautiful muffins - I really like the size of them and now will have to own a muffin tin like that. Muffins are a glorious thing! I haven't seen Osage Oranges in a long time. They look much more more interesting on your blog than I remember! They, and the cute little pumpkin, are perfect for Halloween photos! I knew that oasage orange makes a fabulous natural dye, but I didn't know that is where hedge balls come from. They sell for a pretty penny in the grocery stores and farmers market here. We've used them to deter field mice from moving indoors in the fall. I can almost smell the muffins and your napkins are sweet...simple pleasures are the best! The pumpkin is too cute! Also, I love the muffin pan - much more interesting than your everyday muffin pan. Thanks for the tip on the "muffin" pan. Great idea. I love your napkin too. I've collected a few and they look so classic at a table setting. If we don't use them, then who will? I love your hedge apples! It reminds me of my grandparent's home in Kansas. Have fun decorating with them and your pumpkin. Your green hedge apples are the perfect decorations but can you eat them??? What a wonderful post! I love your vintage napkins too...just started collecting vintage linens myself this year. What a shame some people just cast them off....I feel they need loving homes! Your muffins looks absolutely scrumptious and I'll bet they smell heavenly too! Can't wait to see the Stockings book and order it. Hmmmmmmmm....does Ms. Pumpkin have a man in her life now....inquiring minds need to know, LOL! now i'm gonna have to google osage oranges. I've never seen them before, but i love that bumpy green skin. those tall muffins look great. oh, I love that little pumpkin you got. He is perfect. Green being a favorite color of mine I think the hedge apples are gorgeous, I love their skin, it reminds me of the cookie sprinkles...have fun decorating with them and your cute pumpkin. I do love that lil guy...he is too cute! I would have snatched him up too. 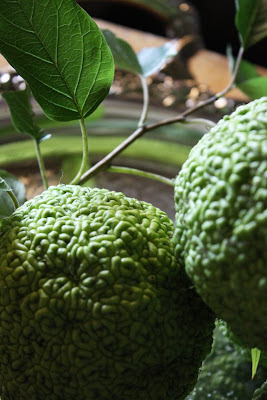 I have never seen or heard of an osage orange! 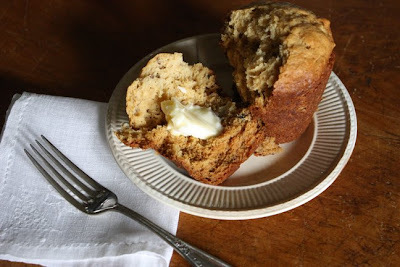 That muffin does look scrumptious...I love banana nut muffins or bread too. We have these apples here too. I never thought of using them for a decoration. What a great idea. Love the Hedge apples, never heard of them before. I love banana pineapple bread. I have used the tall pans for popovers. Today Ina Garten (Barefoot Contessa on the Food Network)set her company table with unpressed linen napkins, saying she loved the casual elegance. (Perfect Dinner Party episode - airs again on August 18). I'm not going to iron mine anymore. Well...going to give the look a try, anyway. Her table did indeed look elegant! Always love your posts and photos. I love how you know all this stuff -- even some history about Kansas. I used to live there you know, but I knew nothing of Osage Orange trees and how they were used. Those fruits are really something! Can't wait to see the stocking book -- and the photography! That muffin pan is spectacular!!! And the linen napkins -- love them! Jennifer....I would love to send you a muffin....but my husband has been finishing them off! Lizzie....I'm right there with you. Don't you love how they make your table settings look fresh and elegant? I like to mix up the napkin patterns too. Love the look when they don't match. Cari....Placing one large muffin in your husband's lunch will really get his attention! Laurie....I didn't know you could use the Osage Orange for dye. What color results from using them and what part would you use? Paulette....You can eat the seeds from the hedge apple according to what I have read. Evidently squirrels love them. But...you have to go through quite a bit to get them out of the hedge apple...and they would have to taste like chocolate to make me want to go to the work to get them out of all the "goop" in the hedge apple. Debbie....Miss Pumpkin is ignoring the "wicked" guy....he's just not her style. (haha) I think it's the grin on his face that has her a twitter! Denise....I will be glad to give you the recipe for my muffins...but we need Debbie to share her recipe for the pineapple/banana nut muffins...don't they sound good? Audrey....you can sew them by hand or machine. I like to do mine by machine. But Barb likes using the hand/whip stitch method. She feels like it gives her more control and each one is the exact same size. Terry....I do like to use my linen table cloths without ironing them too. I put them in the drier and they come out so natural and soft. They don't look like they need an iron's touch. I usually dry the napkins outside on my line. The sunlight bleaches them and they smell so wonderful. They are stiff and wrinkled after hanging outside so I do iron them. I'm probably being overly careful of these beauties....I know linen lasts forever and I shouldn't worry...but however you decide to care for them is fine with me. The only thing I think you should do is use them and enjoy their beauty. They shouldn't be kept in a drawer saved for only special occasions. I say...Make every day special! nice khaki. Alumed cotton is an intense yellow. I love that you used your pop-over pan for muffins! 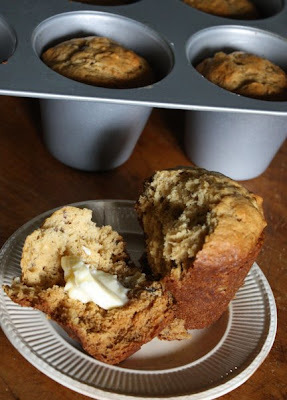 What a great idea - will be trying that with my next batch of muffins!! !